Adam Kokas is multitalented. 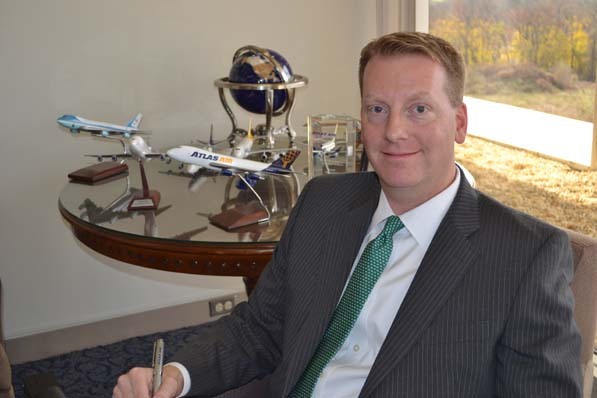 The 41-year-old senior executive serves as general counsel, chief human resources officer, and corporate secretary for Atlas Air Worldwide Holdings, Inc., a New York-based global provider of outsourced aircraft and aviation operating services with 1,850 employees and an annual revenue of more than $1.6 billion. However, Kokas isn’t complaining. The role is exciting, he says, because “there’s always something new.” He sits down with Profile to shed light on his day to day. Some people haven’t heard of Atlas Air Worldwide. Why is that? Kokas: We are the recognized leader in international aviation outsourcing, but we are not a household brand. We operate business to business. For example, we don’t deliver packages door to door or sell tickets to passengers; we operate modern, efficient cargo and passenger aircraft on behalf of leading international airlines, express delivery providers, freight forwarders, the US military, charter customers, and others. We operate the world’s largest fleet of Boeing 747 freighter aircraft, and about 75 percent of our volume is driven by our core “ACMI” business—where we provide aircraft, crew, maintenance, and insurance to our customers under long-term contracts. Kokas: There are a number of things. First, I think we have the best management team and employees in the industry. Second, our business model is unique: last year, for example, we flew into 361 cities in 113 countries. Third, we serve a diverse, blue-chip customer base, ranging from airlines such as British Airways, Emirates, Etihad, and Qantas; express companies and freight forwarders like DHL Express and Panalpina; and others—including Boeing and the US military. Finally, we have had a long period of sustained profitability. I’m not aware of another air carrier with a record like ours. 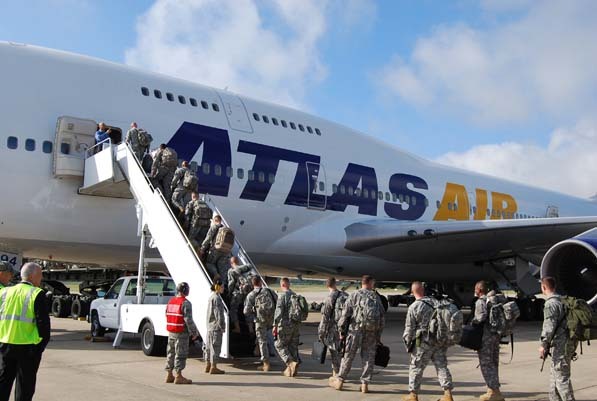 Atlas Air has long been a key transportation partner for the US military, and has recently instated a fleet of passenger aircraft to help move troops across the globe. What allowed the airline to weather such difficult times? Kokas: We have built a resilient company. We have transformed and diversified our business model. And we are executing on a strategic growth plan that leverages our core competencies and underscores our ability to perform well in all economic conditions. In addition to our focus on our ACMI services, we have aggressively managed and modernized our fleet, have added and are adding next-generation Boeing 747-8 Freighters, and we are capitalizing on new organizational capabilities. These include flying passengers and cargo for the United States military; asset-light “CMI” operations, a subset of ACMI, where we crew, maintain, and insure aircraft that are provided by our customers; and we have moved beyond the 747 into Boeing 767 passenger and cargo service. There must be some challenges. Kokas: We face a lot of the same challenges that every other business globally faces—the ability to sustain and grow our business while managing costs and maintaining a solid balance sheet in a slow-growth, if not recessionary, economic environment. We also look to attract, retain, and reward high-quality employees. How did you end up working at Atlas? Kokas: I’m a corporate and business lawyer by training and experience. I spent my early career at law firms in New York. In 2004, my firm began representing the creditors of Atlas Air in its bankruptcy and reorganization. Atlas was a great company, but the early 2000s were rough years for the aviation industry and airfreight carriers. The economic environment was challenging, and the Sarbanes–Oxley Act was taking effect, requiring changes in corporate governance for public companies. So, after the reorganization, I transitioned into a role representing the new board of directors through the early process of emergence, and I gradually progressed into outside corporate counsel, representing the company itself. In 2006, Atlas brought on a new president and CEO, Bill Flynn, and one of the first things he did was promote the company’s general counsel to COO and hire me as the company’s new general counsel. You have a number of roles. How do you balance them? Kokas: First of all, I have a great team in both my legal and human resources groups. While you may not see many executives serving as both general counsel and chief human resources officer, I think they do fit together well, because many HR issues have a legal and compliance element, and so much of executive compensation now involves a company’s legal group. I run the legal department like a law firm: while I am involved in most things, I often work as the assigning partner, so matters come through me before going to other attorneys for assistance. On the HR side, while I am involved in much of the day to day, a lot of what I work on is strategic in nature. Still, it all is challenging work and often with long hours; we operate all over the globe. I very much enjoy it, though. The company is amazing, and I love my job. But that, in part, is because I view myself first and foremost as a business executive, and I have such diverse areas of responsibility. While we all have areas of specialization, people in my groups are given the chance to work in different areas with legal or HR. Our benefits group has helped with employee recruiting, for example. Working in so many areas keeps it fresh for me. What strategies does the company use to get ahead? Kokas: First, we have a culture of continuous improvement, which means we’re never satisfied; we’re always looking at what’s next for the company. For example, we recently achieved more than $120 million in annualized cost savings by making processes and procurement efforts more efficient. Second, we are leveraging our core competencies and expertise to build a stronger company and deliver greater value to our customers and stockholders. All of our growth has been disciplined and organic, meaning our growth has come internally and through joint ventures, not from buying other companies. Third, we are focused on balance sheet strength, so we’re not overleveraged. And, finally, we focus on our brand. When we’re making a long-term investment in assets—as we did when we recently purchased nine Boeing 747-8F aircraft—we then have to go place them with customers. And that requires us to continue to deliver innovative, reliable, value-added service and maintain solid relationships with blue-chip companies. What’s next for the airline? Kokas: We want to continue to grow and diversify our business. To do that, we need to continue to execute on a strategic growth plan that leverages our core competencies and capitalizes on new organizational capabilities. For example, President Barack Obama has said the United States would be out of Afghanistan as early as the end of 2013. That may decrease our military cargo volumes, so we need to focus on other areas of growth. We have been successful at that. For example, for the first 18 years of our existence, we flew only one type of aircraft, the Boeing 747 freighter. In our 19th year, we began flying Boeing 747 passenger planes. Now, in our 20th anniversary year, we have a more diverse fleet that includes freighter and passenger 747s as well as Boeing 767s. A couple of years ago, we didn’t fly passengers at all; for over a year now, we’ve flown passengers for the United States military. That portion of our military business is now greater than our military cargo business.